Ayant retrouvé ma vieille guitare Harmony cassé au niveau de la table, je l'ai refaite et me suis laché. 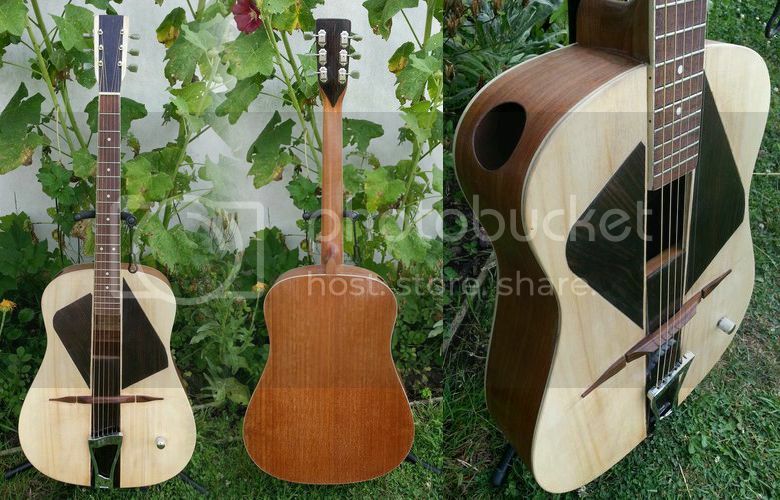 La table est en spruce avec le milieu en ébène, les renforts ont été recollés, le chevalet est de type jazz manouche en bois exotique, les pickuards sont en ébènes comme la tête de la guitare. Les mécaniques sont de type gibson. L' instrument est électrifié avec un pièzo placé sous la table à l emplacement du chevalet et une sortie jack et le réglage du volume sur la table. Malheureusement le piézo vient de me lacher, a réparer donc. A ma grande surprise le son est fantastique et très bluesy. Du coups je m en sépare car j ai d'autres projet de guitare custom en cours. Did you understand that? My French isn't very good but from what I can gather, the guitar is a re-built Harmony with a new top of spruce with ebony inserts. Ebony is also used for the pickguards (which together with the rectangular sound hole contrive to give the guitar an almost Art Deco look) and the headstock inlay. The guitar also features Gibson tuners, a Gyspy Jazz style bridge with a piezo (now non-functioning?) pickup beneath it. Oh, and the photos show us it has a sound port on the upper rim. I'm not quite sure that it is really a prototype as claimed in the eBay listing title, but it's certainly a head turner. Currently listed on eBay.fr with a Buy It Now price of €270. That can't sound very good... the top looks like it was cut from a thick slab from a wooden shipping crate, and that metal knob has *got* to be killing a lot of the vibration the top needs. You'd think so, wouldn't you? But then look at things like cigar box guitars which are basically made from junk and they can have a fantastic tone for blues. As for the location of the metal knob, I'm not so sure about it killing vibrations. Manufacturers including Gibson and Martin were putting volume and tone knobs on the top of their electrified acoustics for a couple of decades before the fashion of having the controls on the upper rim started. What about Babicz guitars that have each of the strings anchored to a metal post in the top of the guitar some distance behind the bridge? Those guitars are said to have a superior tone. Oh, and I wouldn't have thought the top was a thick slab. It's more likely that the sides of the square soundhole have an inner lip. The lip looks to be a brace to me. The knob would have no discernible affect on the sound. Maybe it's just me, but the appointments look out of place on a flat-top.